Anyone who was bothered by the fourth-wall-breaking explanations of the fiscal crisis in The Big Short will want to stay far, far away from Boom Bust Boom, a documentary that’s ostensibly a 70-minute version of those quirky little info-dumps. Monty Python’s Terry Jones—working alongside his son Bill, Bill’s creative partner Ben Timlett, economist Theo Kocken, and various animation companies—throw cartoons, puppets, songs, and snazzy graphics into their film, to liven up what is ostensibly an unbroken string of talking-head interviews. It’s like a movie version of Economics For Dummies or a freshman class lecture by a self-styled “cool” professor. Some may find this approach grating—or at the least, unduly remedial. But for those who aren’t automatically turned off by the idea of an issue-doc that Schoolhouse Rock-ifies a serious, grown-up subject, Boom Bust Boom is a worthwhile way to spend an hour. Terry Jones is a delightful fellow, with none of the smugness or smirkiness that undercuts hectoring documentarians like Michael Moore (or, more recently, Russell Brand). And Boom Bust Boom has an important point to make, beyond the usual rants about how the system is stacked against the working class. This movie declares that the problem with the world economy isn’t the wild turns of fortune—which are inevitable—but rather the arrogance of financial institutions and educators, who seem to believe that they’ve figured out how to prevent crashes. 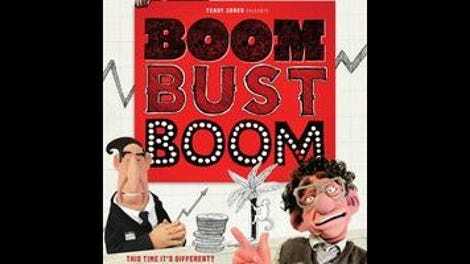 Boom Bust Boom has two main thrusts. 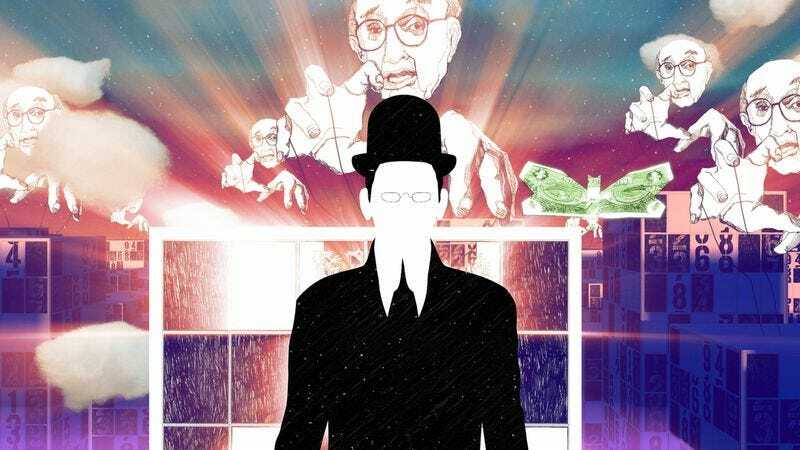 Most of the first half of the film is devoted to a mini-history of economic bubbles: the tulip craze, the U.K. railway mania, the stock market crash of 1929, and so on. An impressive slate of interviewees (including Paul Krugman, Robert Shiller, George Magnus, and others) break down not just the facts of what happened, but also the sociological and psychological reasons why bubbles expand and burst every so often. Basically, when it comes to the economy, perception often becomes reality, and investors presume that the sheer number of people putting their money into a commodity is a sign that it’s failure-proof. The rest of Boom Bust Boom digs deeper into why even academics who should know better fail to spot these bubbles as they’re occurring. The filmmakers point their fingers at an educational system that emphasizes statistical modeling over historical analysis, creating the illusion that that conditions that led to the “South Sea Bubble” of the early 1700s have long since been corrected thanks to math. Jones and company propose that if economics majors were taught that crashes are bound to happen, then those students might become corporate or government consultants who advise their clients to minimize risk and prepare for downturns—thereby keeping ordinary citizens from suffering because of other folks’ stupidity. Boom Bust Boom makes a compelling case, even if most of its evidence is anecdotal. The film spends some time on a monkey-dominated island off the coast of Florida, where researchers have discovered primates can be goaded toward irrational economic behavior. And among the interviewees are economists with intimate knowledge of the 2007-08 collapse, who talk about how the banks that failed prepared only for small dips on their balance sheets, not the complete meltdown that they should’ve known would be coming someday. Boom Bust Boom even subtly exploits some of humanity’s tendency toward rationalization, by eschewing pessimism and suggesting that we’re all smart enough to do better when the next crash comes, provided that we pay attention to this film. It’s no accident that the title of documentary ends on an “up” note. It means to encourage, not terrify viewers into paralysis. None of this necessarily excuses some of the goofier or more useless aspects of the presentation, like South Park clip that’s supposed to explain how money managers bankrupt clients, or the largely unhelpful interjections of activist-actor John Cusack. There’s something inherently irksome about the apparent rationale for Boom Bust Boom’s cutesy hand-holding, which implies that we’re all like children when it come to economic issues. That Jones is able to preside over a movie that makes that point without ever becoming insufferable is a testament to his affability. Or maybe it just indicates that Boom Bust Boom is right about what we need to hear, and how we need to hear it.